Cal that gift is beautiful - what a lucky lady! Glad you had such a super time. What a fabby gift - absolutely lovely. This is stunning! What a fabulous gift! What a fantastic gift !!!!! he he he . Seriously it was just beautiful and I shall treasure it. It was lovely to have you and you're welcome any time. We were lucky with the weather though weren't we. Cal that gift is gorgeous, what a lucky friend, I have been storking your blog for a while,and you always have insprational stuff to show us. Boy were they lucky to get a fabby gift like that ,im well impressed love everything about it . this is just amazing.. I love this. Love the inchies gift, just beautiful!! Have been smiling over Jack jnr, at least he takes a good photo!! 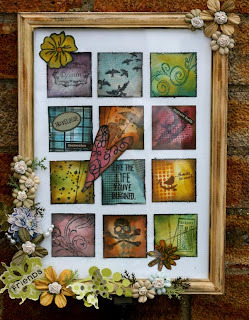 Hello Carole, love this frame with all the twinchies in it nice use of colour. thanks for visiting my blog..your mum makes me laugh every Thursday and makes the most gorgeous scones and cakes.